So very honored to be recognized this week in Elkader at The Annual Community Awards Banquet. The Art in the Park Committee was selected for the Main Street Volunteer of the Year Award! They don't typically give this award to a group, but felt it was appropriate in this case and we are so honored! A little background: I moved to Iowa from NC in the fall of 2013. I immediately fell in love with this small-town life, the charm, and the community. I’ve been impressed from day one with the amount of businesses, eclectic shops, restaurants, and quality of life this beautiful corner of Iowa has to offer. It was also super important for me to meet other artists in the area. I was lucky to find such a wealth of talent and friendship! When a handful of my new artist friends asked me to join them in helping plan Elkader’s first-ever fine art festival, I jumped at the opportunity! Main Street Elkader took us on as a special project, which aided in several ways. We quickly gained attention and recognition on the state level, receiving the Iowa Tourism Outstanding New Event Award in 2016. We were also awarded grants from the Iowa Arts Council, The National Endowment for the Arts and Department of Cultural Affairs, and other area grants, along with generous sponsorship from numerous area businesses. Earning this support from across the board was instrumental in helping our event take off from year one. We quickly learned this would be no “walk in the park.” We met weekly the first year (and continue to meet quite regularly in our fifth year). We take about a month off after the event and then the planning for the next year resumes. It never really ends, as there’s always something to think about or discuss. Our group is passionate, fun, lively—-even with an average meeting time of 2.5 hours, plus any homework we need to complete in between. (Don’t worry, we’re working on streamlining!) There’s always something new to think through, a new idea to gain community involvement, a project to have at the festival, thoughts on fundraising and marketing, new artist perks, etc. What can I say; you put several artists in one room and you get lots of ideas! It’s hard to put into words the amount of time that we’ve all put into this event, but it’s definitely been a labor of love! We love our community. We love art. We love hosting a free event that also includes kids’ activities, music, food, wine, and fun for the whole family! Being able to share our eclectic town(s) in northeast Iowa and a true fine art experience with local residents and tourists from afar has been amazing. We hope to continue to share this passion and continue to grow tourism in our area, which directly and indirectly boosts our economy all year long. Fun fact: From our sample survey, we estimate that it was the first visit to Elkader for 11% of visitors who attended Art in the Park in 2018 (up from 8% in 2015). From our very first event, visitors couldn’t believe it was our first art festival. We were asked by other festival organizers how we did it, and the answer is: we did our homework. We took really good notes and learned a lot from other festivals that we had participated in. We met with other successful festival organizers. We wrote grants. We were driven and passionate. We gained the support of our community and surrounding communities. We got great volunteers (which was invaluable). We were able to market to a 200-mile radius, bringing tourists from all over in search of original art. We made it a point to make our event juried and to limit the spaces. And one of our biggest tips…we take pride in taking care of our artists. We love to hear the feedback from our vendor surveys and to know how much our artists enjoy our venue. It’s all a balancing act and all of these things add up to a great event. Thank YOU - to everyone involved throughout the years. We’ve been so fortunate through the years to have amazing folks on the committee, fantastic volunteers throughout the event, and phenomenal sponsorship to help us with our vast marketing campaign. 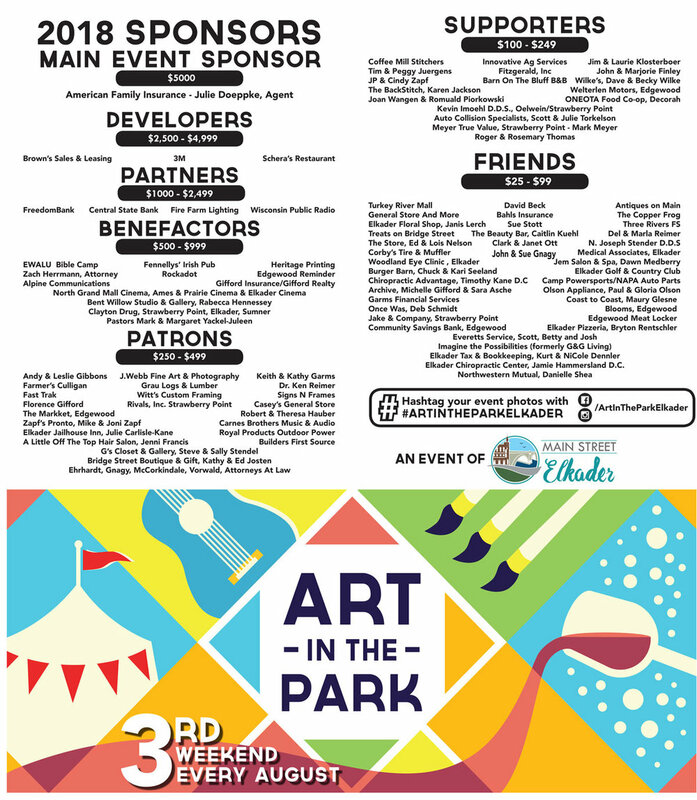 Art in the Park is made possible by all of you! Although the Art in the Park Committee has evolved over the years, the passion for putting on a great free event for our community and showcasing some amazing artists from all over the region and beyond is steadfast. It feels really good to be recognized for the countless hours it takes to organize such an awesome event! Thank you to every single person who contributed in any way to the success of our first four years… we can’t wait to see what the fifth annual event will offer! Let us know if you’d like to be part of Art in the Park 2019. We couldn't do it without the support from our community, volunteers, sponsors, or artists! THANK YOU! A huge thanks to all of these weekend festival volunteers, many of which have volunteered multiple years and in multiple time slots! I couldn’t believe the number of times I saw Jenna Helgerson’s name on the volunteer sign in sheet! Way to go all of you! Thank you for your help, for showing pride in your community, for taking action, and for supporting the arts in NE Iowa! Special thanks to our standout youth volunteers! Last but not least, I’d like to say a huge shout-out to each of the co-founders (and their spouses/families/etc) for all of the time, energy, and passion it took to get this thing started in 2015! & to my ever supportive husband & daughter - love you both, Z+E! I’m almost certain that I’ve forgotten names, and everyone may not have signed in, but THANK YOU to each and every one of you for your help with Art in the Park and we hope can count on you again! Please let me know if I missed you — I’d love to recognize you!